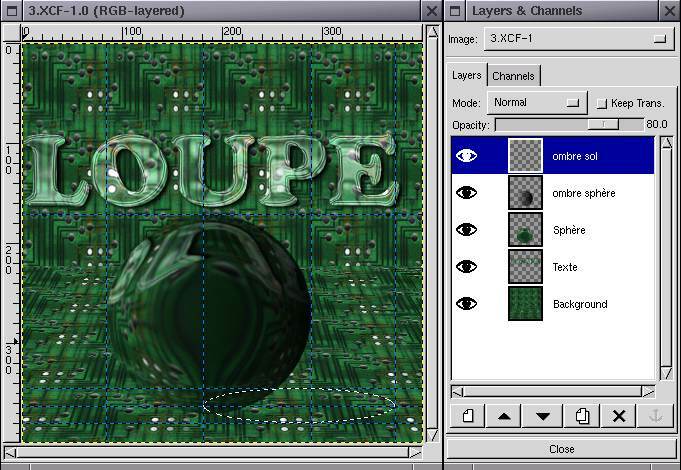 Gimp is a software exclusively 2D, but with a few tricks and thanks to the numerous tools that are available, it is possible to create an image in pseudo 3D. Polish it by adding shadows, impressive splendour and lenses. 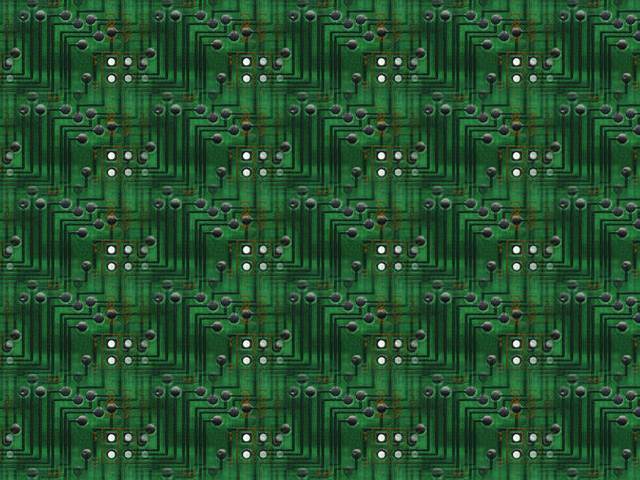 I assume that the pattern "circuit" is available in Gimp. If this isn't the case, any other motive (the list in Gimp appears by clicking on <File><Dialogs><Patterns> or by pressing [Shift+ Ctrl+ P] ) will do for the matter. In this list, press the pattern to get the image shown in size 1:1. This shows also the name of the pattern at the top of the window. 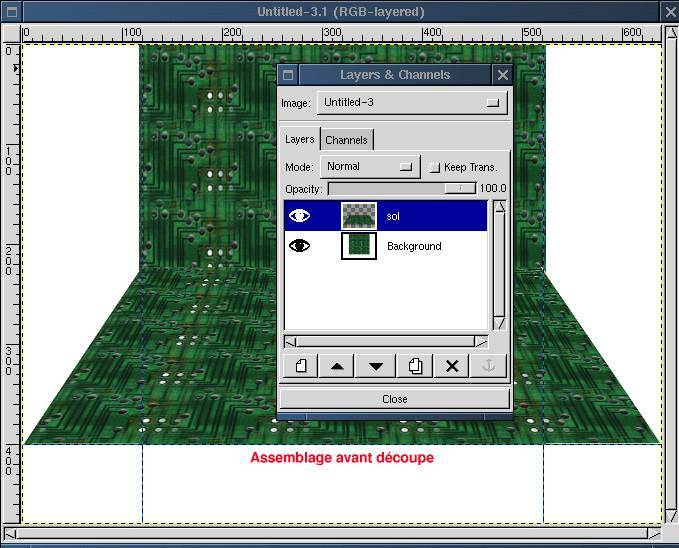 If you want to reproduce the suggested image exactly and the motive "circuit" doesn't exist in Gimp, you can get it. 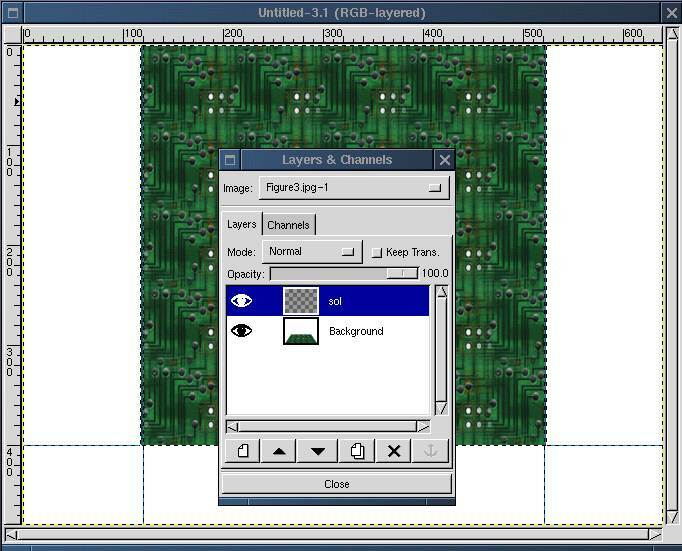 For that open Gimp, load the file /opt/kde/share/wallpapers/circuit.jpg and save it with the extension"pat", choose in the list of formats <By extension> in the menu <Save Image>, that is /usr/local/share/gimp/patterns/circuit.pat. 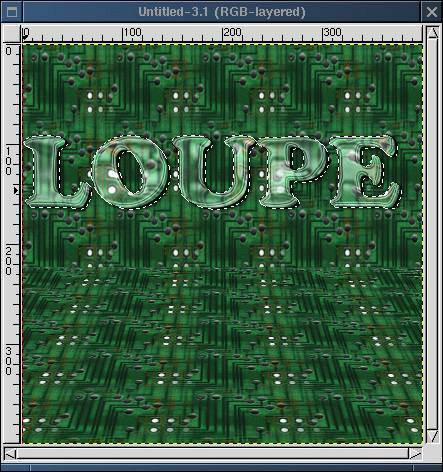 The pattern will be available the next time Gimp is started. It should be noted that the suggested way here is for KDE 1.1.1 and Gimp 1.0.4 installed on Mandrake 5.3; it can be different in other distributions. Start Gimp, if this isn't already done. Click in the active window. The final image will have a dimension of 400x400 (arbitrary choice). You can distort 2.jpg which is shown on the screen and which is much bigger (640x480), with the help of the magnetic guides. They are activated by clicking in the rulers that border the image. Click on one ruler and then press the left button of the mouse, hold it and move the pointer to the work zone. This will show a a dotted red line moving, horizontal or vertical depending on the ruler on which you have clicked. 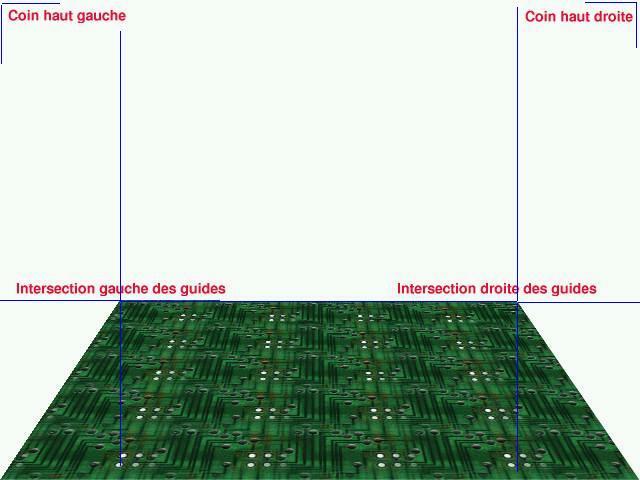 Place the guides as shown in the image below. This dotted line becomes blue when it is unselected: it is a magnetic guide that draws the mouse pointer or the border of a selection when you approach it. Place in this way a horizontal guide at 300 pixels from the origin, then two horizontal guides, one at 120 and the other at 520. Distort the selection to get a trapeze while making the corners high/left of the selection coincide with the left intersection of the guides. Attention this is a cpu power intensive operation and calculation will need some tim. Wait until it is finished before clicking somewhere else. Iconify the image or send it to another desktop. As a precaution can you save it also. Place a horizontal guide at 400 pixels, and two vertical guides, one at 120 and the other at 520. Select Transform Layer or Selection and, in <Tool option> which should still be open from the former call, choose Scaling. 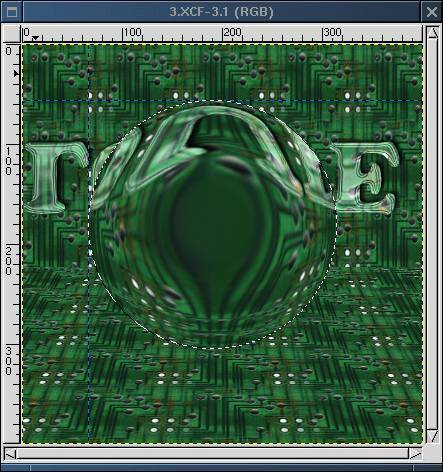 Distort the layer so that a square of 400x400 ends with its borders at the guides. Flatten the image by clicking> Layers> Flatten image. Now the image consists of only one layer. Save (just for security reasons) as 3.XCF (the format of Gimp preserves the layers. Enter the text "LOUPE" ("Magnifying glass" or something else), Font "Cooper" (or other), Font size "105", Background "/opt/kde/share/wallpapers/circuit.jpg", OK. Note: the font "Cooper" is part of the package "Freefont" and isn't installed per default in all distributions. It is a good idea to install this package as well as the package "Sharefont" which are essential for a the Logos of gimp. (101 vectorial fonds are available from Christoph Lameter, <clameter@waterf.org>. The logo is produced; the letters are textured with the same motive as the wall but in a bigger scale than that of the wall which was reduced. You get a magnifying glass effect. The logo consists of several layers, of which one is called "Background". This is of no use, you must remove it by double-clicking > Layers> Layers & channels> Delete layer, the layer that will be removed must be selected. You can select it by clicking on the button: it will be in the blue splendour. Paste it into 3.XCF (which hasn't been closed) on the layer "Text"
Place it according to demand (that what can reasonably be seen through the transparency must correspond more or less with the drawing of the wall which lies behind. See Figure 7). The sphere must reflect the text on to the front wall, that is, it must be invers to the original and rounded on the sphere. Now it will become more delicate. Use the circular selection tool (press Shift and at the same time move the mouse so that you obtain a circle and not an ellipse), so that at least 3 letters are inside the selection and are situated in the upper part of the circle. The selection is always active, copy it into the press paper. You can now close the drawing without saving. Create a layer called "sphere"
Paste the sphere and place it (even change its scale) so that the reflexive letters correspond with the letters of the wall. This is the part of the work that reflects more the sensibility and tact of the creator. I will only give general advice to let each creator express his/her own creativity. 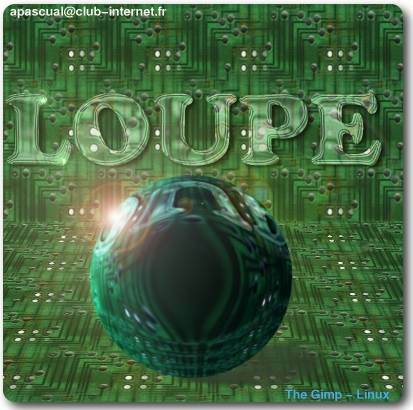 A remark for continuing: the letters of the logo "LOUPE" receive a horizontal light coming from the left side of the image (observe the shadows). The sphere must therefore logically be lighted in the same manner; in consequence, it must project a resulting shadow of that light on the bottom and have a portion of its surface in the shadow. Add a layer "shadow sphere", transparent, opacity 90 (there is always the possibility to change this value), mixing mode "Normal"
Place 4 magnetic guides tangent to the sphere. Carry out a circular selection with the help of the guides (starting at the intersection high/left to the intersection low/right). The selection must surround the sphere. Double-click on the tool Fill with a color gardient; in the menu <Tool options> choose "Blend: FG to transparent" and "Gradient: Linear". Fill the circular selection with a degradation of black ->transparent by drawing a horizontal line which goes from the extreme right part of the diameter of the sphere to the extreme left part of the sphere (you must imagine the diameter: it is not represented). The shadow is in its position. Make some trials with the mixing mode of the layer "shadow sphere", to see how the black pixels behave with the ones on the layer below. Save the work when you are satisfied. Double-click on the tool Fill with a color or pattern; in the menu <Tool options> choose "Mode: Normal" and "Fill Type: Color fill". Fill the selection with this green. The light is coming from left, the whole left frame of the sphere must be more luminous. Carry out a selection that is big enough in crescending from the left frame of the sphere with the Feather tool (more difficult with the lasso). Paint it in degradation FG->Transparent with the same method as before, but from left to right. Mix the layers with the mode "overlay". If the effect isn't emphasized enough, paint it two or three times with the same method. The incoming light of the sphere is projected in the objective of the camera, it produces an aberration, called "flare lens". Enter the back-shifted values in X and Y in the parameters "Center of Flare FX". You can also distort the cursor with the mouse on the button of the image and then place the center of the reflexion visually. You can now polish by adding some points of light by double-clicking> Filters> Light Effects> Super Nova with the parameters so that Radius 2 or 3 and Spoke 50 on the letters of the glass near the lighted route. The colours of this points are a matter of taste. Voilà. The work is almost finished. I write almost because when we look at it there are surely mistakes, approximations... All creators have their own view of the objects and their own style. Everyone will have a different opinion. Because Linux, and more Gimp, or evenmore the enthusiasm of the creator should not be neglected as a source of amusement.